You can label Stephen King’s novels with a variety of acclaim, but pulse-pounding, white-knuckle-thrill-ride has never quite seemed appropriate for his extensive body of work. The Stand, what I consider his finest novel to date, is more enthralling than exhilarating; while The Shining is more nerve-wracking (and genuinely terrifying) than adrenaline-charged. No matter the scope of King’s plots, no matter what genre his respective novels are pigeonholed in, they’re always page-turners, and always demonstrate a level of finesse that other authors can only dream of replicating. This isn’t breaking news: King is a masterful storyteller, one of the greatest to have lived, and with MR MERCEDES he has crafted my favorite crime novel of 2014, and one that deserves to labelled as a modern classic. Crime fiction is bursting with tropes. They’re unavoidable, but they’re malleable, and the best authors mould them and make them their playthings, and use them to their narrative’s benefit. 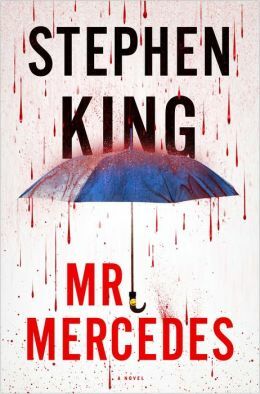 Take the protagonist of MR MERCEDES, for example: Bill Hodges, a retired ex-cop who is circling the drain. Mandatory retirement and the loss of his badge has stripped his life of purpose; he chose the job over his family, and as such, his days are now spent watching daytime television and reminiscing on the unsolved cases he left behind. The one that haunts him most involves the Mercedes Killer, who drove into a crowd at an unemployment expo, killing eight and injuring more. Through sheer luck and circumstances rather than meticulous planning, the killer vanished. The police had no viable leads, no witnesses able to identify a suspect; they were at a dead end. And then Hodges was retired, and the case lost its relevancy with the media, and then with the department. The Mercedes Killer is a young man named Brady Hartfield, who we’re introduced to inside the first fifty pages of the novel. He intends on breaking Hodges, the man who tried to hunt him and failed miserably, and lead the old detective to suicide. He crafts a carefully worded letter to Hodges, expecting it to send him over the edge, make him place the barrel of his revolver in his mouth and squeeze the trigger. Instead, Hodges is reinvigorated by the reappearance of the Mercedes Killer, and he begins a private investigation. Infuriated, the Mercedes Killer plans another act of random terror – and so begins a cat-and-mouse chase, hero versus villain, with twists and turns along the way. MR MERCEDES moves quickly. It’s a thriller, eloquently narrated with King’s trademark prose. There are no supernatural elements on show here; there is no dark force of nature at work. MR MERCEDES is an examination of two sides of the fence, hero and villain, and their respective motivations. Sick and twisted as Hartfield’s are, Hodges’s mentality is similarly questionable (though not to the same degree): he should hand over his information to the proper authorities, who would have a better handle on the situation, but he is blinded by the zest he feels now that he’s ingrained in another investigation. His choices have consequences, and people die because of them. Despite clocking in at over 400 pages, not a page, paragraph or sentence is wasted in MR MERCEDES. It’s a fast read despite its enormity, and one I’m destined to return to in the years that follow; the highest praise I can bestow upon a novel. Now, bring on November, and King’s fourth novel in the space of two years: REVIVAL.